Members of Grace Church, a Grace Brethren church in Wooster, Ohio (Bob Fetterhoff, pastor), were among those from several churches who blessed the people of the community over the weekend with a party at the Wooster Hope Center. A story and video in today’s Wooster Daily Record tells the story. A portion of the article appears below. Click here to read the complete story and view the video. Oh, the weather outside was frightful, but inside, it was delightful, there might’ve been other places to go, but many chose to go to Wooster Hope. 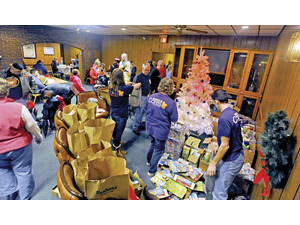 People began lining up more than an hour early in the rain for Wooster Hope Center’s community Christmas party at the Knights of Columbus Saturday. About 75 people were standing in line when the doors finally opened. About 400 guests were treated to a turkey dinner with all of the fixings, and there were activities for the children. They also had the chance to talk to Santa and Mrs. Claus. Dr. Dave provided the children with balloon sculptures. Dr. Dave even made a special reindeer antler hat out of balloons for Rob Doerr, who celebrated a birthday Saturday. Click here to read the complete story and view the video.